Set This Circus Down: cali, the road dog! Cali's a road dog. Last fall she toured with us for just under a month, spending the majority of her time in Daytona Beach and Orlando. Sometimes she goes to work with us and other times she stays in our hotel room... it all depends on how long our work day is and what the weather is like. 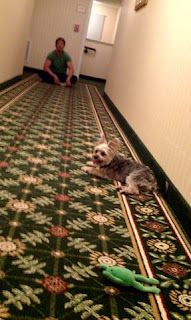 Last week Cali went on the road with us to Orlando and Atlanta. 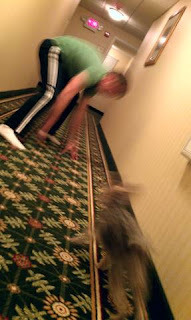 While in hotels we play in the hall to get energy out of her. Cali favorite is monkey in the middle! Love it! So what's it like staying at hotels that allow pets? I think a fear of mine is 'catching' something if I were to stay? IE fleas? I"m no expert but I'd love to hear advice on that! Ahhh she is so cute! I want one just like her, I think my cat would be less than thrilled though. She is adorable! Oh my goodness!! precious cali girl! we took uggie and bailey on a road trip once. they didnt quite understand it. i think it might have been all the different smells. 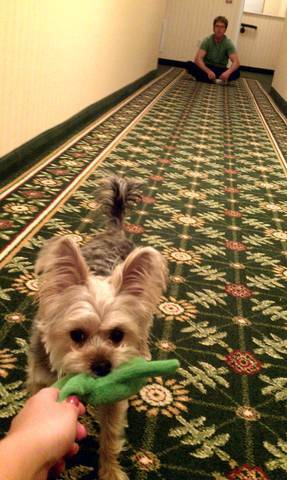 are the pet friendly hotels you all have used nice? I have a hard time finding ones that aren't total dumps. Looks like she is living the life :) Cute too! Cali looks like so much fun! I wish my Baileah would play like Cali does but he's so rough! Looks like she had a great time in that hallway! !